NextWill the real Lady Godiva please raise your hand? The overtones and credibility with which Roses & Cigarettes’ bring to their classic California sound is rich and rewarding to any music fan prepared to open their hearts and minds. From their beginnings, this dynamic duo’s relationship has feed off both their similar tastes in music, but especially because of their mutual respect for one another as collaborators. While lead singer Jenny Pagliaro brings her unique and powerful vocals to the mix, guitarist Angela Petrilli provides much of the driving character of their sound that supports the personal and relatable lyrics about life, love, loss and heartache on their self-titled album. With the release of their debut album in May of 2015, Roses & Cigarettes were set to ignite their career, when in the middle of that same year Pagliaro was diagnosed with Stage II breast cancer. The shattering news delayed any plans of further touring, but it goes without saying, Jenny’s health and her fight with cancer took precedence. A little over a year later it progressed to Stage IV Metastatic Brest Cancer, before a new course of treatment gave Jenny hope more recently this year. So it seems that this thing we call music is without doubt an incredible thing. It inspires, it challenges us and we seek its comforting nature. 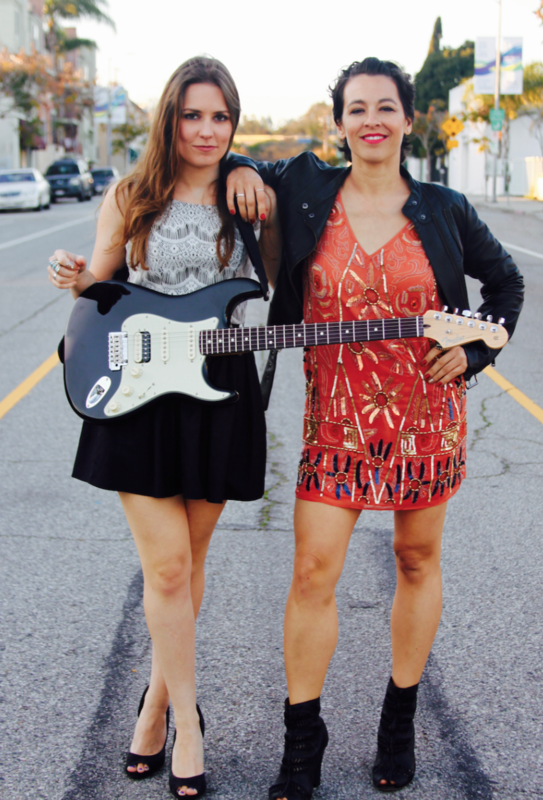 That said, Roses & Cigarettes are back stronger than ever, as Jenny Pagliaro and Angela Petrilli embark on some new projects, shows and tours that just maybe feels like a second coming. I recently connected with Roses & Cigarettes to talk about their collective passion for music. Here is what we talked about. I feel fortunate to have stumbled across your eclectic blend of roots, rock and Americana sound. My favourite songs from your debut self-titled album are Another Way, Broken Down in Barstow and especially Whiskey Down. What’s your favourite song on it? Jenny: I switch around a lot! For a long time Shelter was my front runner! But I’m proud of all of them for different reasons!! Angela: Gypsy Woman was always a standout to me. We joke that it’s the opus of our debut album. Even the first time Jenny played the song for me I knew it was special. The songs are like our kids and we love them all! Tell me about the process that took place when it came to writing and recording your album Roses & Cigarettes. Did the lyrics and rhythm come first, or the guitar melody? Jenny: It’s always a collaboration! Either I come up with a melody and lyrics and sing it to Angela or she comes up with something on the guitar and sends it to me and I start hearing melodies and lyrics. For our self-titled debut album I also worked co-writing with our producer Michael Lyons before meeting Angela! Then we all came together and it just works! Listening to your album made me realise how much I have come to appreciate music that is sometimes outside my comfort zone. So who influenced you and why did you choose to make your brand of music? Jenny: My influences are everywhere! I grew up listening to Bonnie Raitt, Eric Clapton, James Taylor, Harry Connick Jr., Natalie Cole, then hop over to Janet Jackson! For songwriting I LOVE Ray Lamontagne and Joni Mitchell and of course, Stevie Nicks or anything Fleetwood Mac! Angela: Our sound came about organically. We write music that we want to hear and we’re both so incredibly humbled and thankful that others have responded to our art and have followed us on our musical journey. What do you do for inspiration when you sit down to write a song and/or especially in those moments when you are stuck for an idea? Jenny: Being stuck on something is hard. I’ll give it to old college try a few times and push through but I usually find it best to walk away for a bit. Go do something and then come back to it. Inspiration comes from so many places and strikes at random times. I do my best writing either when I’m not thinking about it, or on an airplane. But that’s not always economical! In the lead up to our interview I was hesitant to talk about your fight with cancer, but you reassured me you were very open about it. You quickly put me at ease, reiterating how important it was to educate people about it. That said, Roses & Cigarettes is in many ways very much intertwined with your life and passion for music. Jenny, can you tell me how your music and the band is an important part of your healing process? Jenny: Music is healing! Having all of these shows booked and continuing to write songs really pushes me forward and makes me realize that this diagnosis doesn’t have to stop me from living the life I want to. I am still alive! I have time to accomplish the things I want to. I just had to adjust what I always thought it would look like. There are definitely more challenges, and we have to be more particular about a lot of things because of my health. Angela helps to push me forward and doesn’t ever let me quit. I can only imagine how protective you and Angela are of each other as friends and collaborators. Can you tell me something surprising about your strong bond? Jenny: We are complete and utter goof balls! We laugh a lot. And we cook a lot! There’s a whole lot of food talk between us! Angela, was the guitar always your first instrument? When/where did you first start playing? Angela: Yes! Guitar was my first instrument. I started playing when I was 9 years old. My mom plays a little guitar and I remember watching her when I was very young and knowing that I would be able to play music. I wanted to play drums, but was encouraged by my parents to pick up guitar instead. I’m glad I did, but I still have that urge to learn a few things behind a drum kit! What music excites you and why? Jenny: Different days it’s different things. When I get a new album I consume it, especially if it’s an artist I love. Genre doesn’t matter. Currently John Mayer’s The Search For Everything is on my repeat list. Angela: I get inspired by all types of music! I’ve always been drawn to the storytelling and emotional imagery of the blues, from a lyrical and instrumental perspective. Artists from Howlin Wolf to BB King, and Muddy Waters to more contemporary players like Stevie Ray Vaughan, Bonnie Raitt, and Gary Clark Jr always make me want to write a song and get practicing on my guitar! I also really love classic rock. Led Zeppelin inspires me on a daily basis. They are THE band I look up to when I write and perform with Roses & Cigarettes. Those guys had it down, from songwriting to their musicality. Their acoustic songs and hard rock songs illustrate their scope as songwriters. For the same band to write songs like “The Rain Song” to “No Quarter” to “Since I’ve Been Loving You” amazes me and inspires me everyday. Angela, I really enjoy watching the amazing covers (songs) you perform from time to time. You make it look so easy. What is your greatest strength and what would you like to improve as a guitarist? Angela: Thank you so much! A strength I am most proud of in my playing is my ear. I am a big believer in listening…really listening. As guitarists, our role changes with every gig and in every band we play with. Sometimes we play lead, and sometimes we step back and support. It’s all about reading the space and finding your appropriate pocket within it. We must adapt as guitar players and listen to what is sonically happening in the musical space we are in. Play the space!!! When we do an acoustic duo show as R&C, my role is not just acoustic guitar, but I am also playing percussion, and lead work as well. I rely on my ear to fill as much space as possible with one instrument, all the while listening to Jenny and being sure that my playing compliments her as a singer and storyteller. When we play full band shows, I play electric guitar. My nuances and role as a guitarist change in that atmosphere. It’s a fun challenge and the practice of being bilingual with a guitar is very fun for me. Acoustic and Electric guitar playing are two completely different monsters and I love to tackle them both! One thing I’d love to improve in my playing is my speed during particular solos! It’s a work in progress…I am learning to love the metronome. Haha. What are some of the earliest and/or most influential concerts you have been to? Jenny: My first concert was The Backstreet Boys, it was super cool at 13 ok?!? Seeing Ray LaMontagne solo acoustic at The Orpheum in Downtown LA was one of my all time favorite concerts I’ve been too. Angela: My first concert was Incubus at The Forum in Los Angeles during their Morning View Tour in 2002 (What I wouldn’t give to see that show again!) Two very influential concerts for me was Heart at The Greek Theater in LA. Heart were joined by Jason Bonham’s Led Zeppelin Experience for the last set and played a ton of Zeppelin songs. Ann and Nancy freakin rocked. It was amazing. I also saw Pearl Jam at Jazz Fest in New Orleans last year. My favorite band in my favorite city with some of the best food I’ve ever eaten with good NOLA folks. That was practically heaven on earth for me! They say the most dominate emotion in the room is the most contagious. I can’t help but feel that Jenny when you sing it comes from the heart. Giving Up On Love and Nowadays are great examples of that. Is that a fair assessment? Jenny: Thank you so much!!!! Some lyrics are about something particular and some are more about a feeling I have. As a singer it’s hard to not want my voice to be perfect EVERY time I sing, but that’s not realistic. I can try and go to that feeling I had when I wrote it and sing from that place though. I can’t always control my allergies, but I can tap into my heart and sing from there! What do you incorporate into your live shows that might be different to your album? What reaction do you get from your audience? Jenny: Our live shows vary a lot from the album! A lot of shows we play acoustic so the songs are stripped down versions. Sometimes we play as a quartet, sometimes we play add a pedal steel player! Angela: We like to talk to the audience and chat with each other during our shows. It’s important to us to invite the audience to see us as Jenny and Angela. We like to crack jokes on stage and poke fun at each other during our banter breaks. We know that people can always stay at home and listen to our album, but when they come to a show, we wanna give ‘em a rock show that expands on the energy from our album. Finally, what can you tell me about your current project? I understand you are back in the studio? Jenny: Directly following the release of our debut album I was diagnosed with breast cancer. It put a halt to a WHOLE lot. We decided to do an Acoustic EP with a few of the songs from our debut album stripped down with just vocals and acoustic guitars because we play live that way a lot. Then we wrote more and decided to release 2 EPs, one with select songs from the first album and a cover, and one EP with new songs to give listeners a taste of what’s to come! Roses & Cigarettes will be opening for The Dustbowl revival at The Federal Underground in Long Beach, California on October 25th 2017. 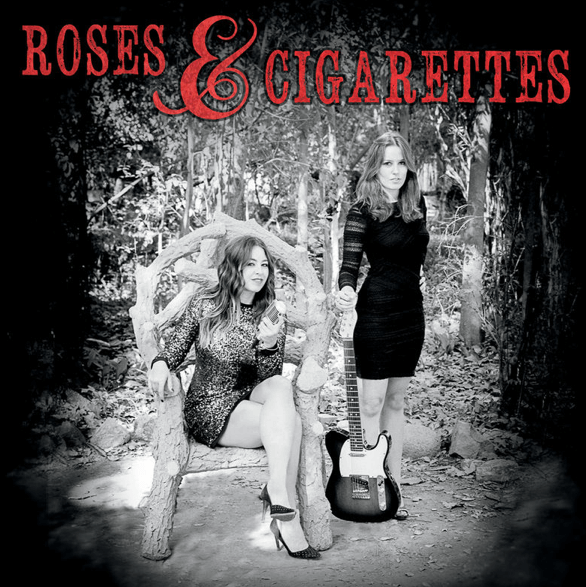 Also check out Roses & Cigarettes debut album available through iTunes. You can connect with Roses & Cigarettes via their Facebook page or twitter feed @rosescigarette. You can also visit or contact Roses & Cigarettes via their website. Follow them on Instagram. Watch them on You Tube. Hear them on Soundcloud. Photo credits: All photos used are copyright and courtesy of Roses & Cigarettes. They cannot be used without their expressed permission. I am not the uploader of You Tube clips embedded. Was not familiar with these ladies, but what an inspiration they are! These ladies are great. At the end of Gypsy Woman, Jenny just kills it vocally. I like the acoustic songs a lot.